South India Tours - Madras, which recently reverted to its historical name Chennai, is the capital of the South Indian State of Tamil Nadu. It is the fourth largest metropolis of India, after New Delhi, Bombay and Calcutta. Chennai is a seaside (and a major port) city where the sea is a rhapsodist blue, hugging the second largest beach in the world. It has many monuments and temples exemplyfying the contributions of the Chola and Pallava Dynasties to the ancient Dravidian civilization. Chennai also has the ancient churches and Cathedrals pointing to British heritage of 150 years. 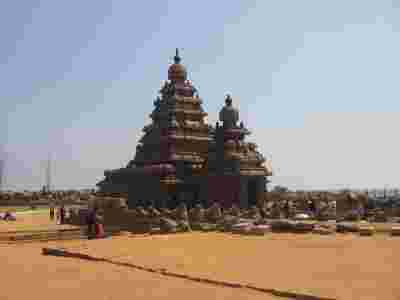 Mahabalipuram, Kanchipuram and Thanjavur are good examples of temple towns where within the temple fortifications grew a multi layered society that preached faith and grew from social harmony. Kanchipuram, also called Kanjeevaram, is famous throughout the country as the center where lustrous silk sarees are woven - South India Tour Booking. South India Tour Packages - Tirupati City is located in the southeastern part of Andhra Pradesh, in Chittoor district. It lies about 152-km northwest of Chennai in the Palkonda Hills. 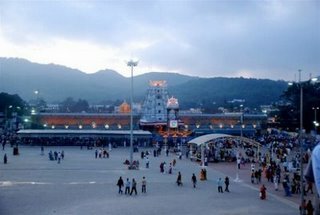 Tirupati is known as the abode of the Hindu god Venkateshvara (also spelt as 'Venkatesvara'), "Lord of Seven Hills". 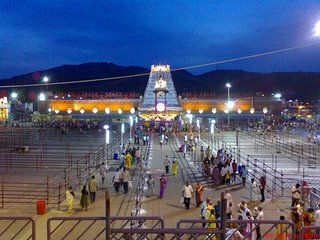 About 10-km northwest of Tirupati, at an elevation of 750m, is the sacred hill of Tirumala, which was considered very holy. One of the most important pilgrimage centers in India, the temple draws millions of pilgrims and is believed to be the busiest pilgrimage centre in the world. Sangam literature, the earliest of Tamil literature (dated between 500 B.C to 300 A.D) mentions of Tirupati as Thrivengadam which used to form the northernmost frontier of the Tamil Kingdoms. Sangam literature such as Ilango Vadigal's Silapadikaram and Satanar's Manimeghalai bear testimony to the existence of a shrine at Tirupati - South India Travel and Tours. 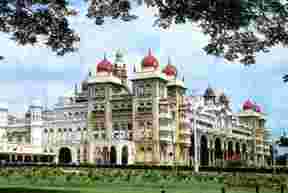 South India Tours - Bangalore , the fifth largest city in India is the capital of Karnataka. The presence of many parks and botanical gardens gave the name of ' Garden city ' to Bangalore. Any tourist can start his tour from Bangalore with its ancient forts, temples, gardens and shopping. 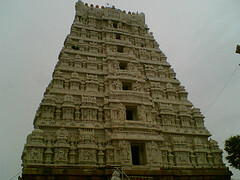 All important tourist attraction in Karnataka can be reached with in a day's journey from Bangalore. The modern city of Bangalore ('Bengaluru') was founded by Kempe Gowda, the Vijayanagar Chieftain of Yelahanga, over 400years ago. But ancient inscriptions pointing to the existence of a village called 'Bengaluru' prior to the 10th century AD. Kempe Gowda built a mud fort in his city with 8 gates which lent their names to different areas inside the fort. Inside the fortress walls, the city grew into a commercial haven divided into localities ('Pet') where individual trades dominated each area. To this day these areas bear their old names such as Chickpet (little town) - South India Tour Booking . South India Tour Packages - MAHABALIPURAM : The total land area is an 8 square kilometers, situated exactly to the mean sea level. The population of this place is 12,000. The climate is moderate and breezy due to the location of the sea close to the land. Tamil and English are the two languages spoken here. There is no specific season for the tourists to visit mahabalipuram as it can be visited in, at any past of the year. The nearest Airport is in Chennai. The nearest railway is in Chengalpattu and it is well connected by road ways. The (ECR) East coastal road which connects chennai and Pondicherry passes through this place. As discussed already. The pallavas are known for their style and architecture there is many architectural monuments that one has to visit in mahabalipuram. 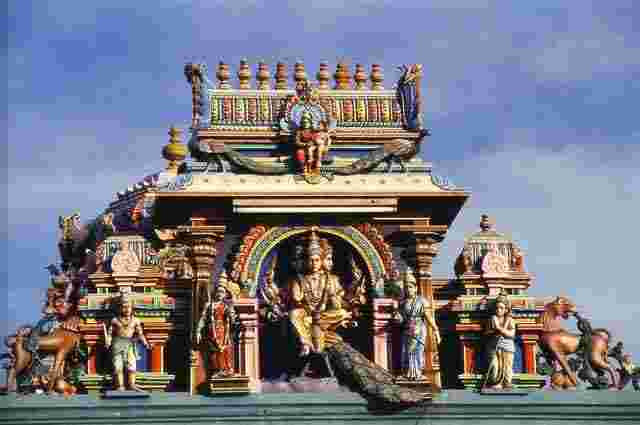 Let us go deep to know there about every single mil stone of the pallavas - South India Travel and Tours. South India Tours - Tourists must have an overall idea about Kanyakumari while traveling to the beautiful district of India. Kanyakumari is situated in the farthest south of the peninsular of India and is in the adjoining point of the three oceans comprising the Arabian Sea, the Bay of Bengal and the Indian Ocean. Kanyakumari has acquired international fame as a Hindu pilgrimage. During the British rule, Kanyakumari was given the official name, Cape Comorin it is because of the English men's lack of ability to pronounce the local names. If one is interested to enjoy the unspoilt charm of natural beauty Kanyakumari is the right place to go for. Through out the year the people across the globe come here to see the splendid views of sunrise and sunset over the crystal clear waters. The multicolored sand is considered to one of the most alluring feature of the beach here - South India Tour Booking. South India Tour Packages - Ooty also known as Udagamandalam is the "Queen of hill stations" and the capital of Nilgiris district. It is one of the most popular tourist resorts in India. Nilgiris means "Blue Mountains". It is a land of picturesque picnic spots. Used to be popular summer and weekend getaway for the Britishers during the colonial days. It is situated at an altitude of 2,240 meters above sea level. One of the reasons people like to visit hill stations is that, they not only offer a respite from the dust and pollution of the city but also give people a chance to see the undefiled beauty of nature. The green hills, the cascading waterfalls and sparkling brooks, all make the hill stations a delight for the eyes of the urban dweller. Ooty is an ideal hill station since it offers all this and much more - South India Travel and Tours. South India Tours - Coimbatore, also known as the Manchester of South India, is home to a large number textile mills, textile machinery manufacturers, hosiery units and engineering industries. Coimbatore (population � 1.25 million) is the second biggest city of the southern state of Tamilnadu, India and is identified as one of the fast developing metros of India. There are about 50,000 small, medium and large scale industries. It has 5 universities, 25 Engineering Institutions & more than 100 arts & science colleges. Coimbatore city is strategically located at the junction of the three modern southern states Tamilnadu, Kerala and Karnataka with proximity to many important cities of Southern India. It is well connected by air and surface transport. This friendly city has a salubrious climate and surrounded by major tourist spots, has always been a natural favorite with international tourists - South India Tour Booking. South India Tours - Ooty also known as Udagamandalam is the "Queen of hill stations" and the capital of Nilgiris district. It is one of the most popular tourist resorts in India. Nilgiris means "Blue Mountains". It is a land of picturesque picnic spots. Used to be popular summer and weekend getaway for the Britishers during the colonial days. It is situated at an altitude of 2,240 meters above sea level. One of the reasons people like to visit hill stations is that, they not only offer a respite from the dust and pollution of the city but also give people a chance to see the undefiled beauty of nature. The green hills, the cascading waterfalls and sparkling brooks, all make the hill stations a delight for the eyes of the urban dweller. Ooty is an ideal hill station since it offers all this and much more - South India Tour Booking. South India Tour Packages - Before embarking on a trip to this temple city of Tamil Nadu, one should have some information about Madurai. 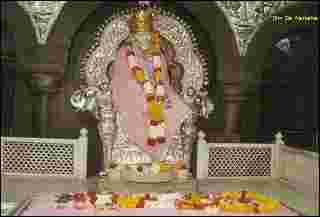 This city is one of the pilgrimage centers of Hindu religion and thousands of tourists from all across the world visit here throughout the year. 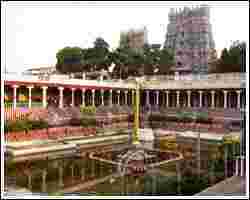 The main attraction of Madurai is the Meenakshi Temple, dedicated to Lord Sundareshvara. 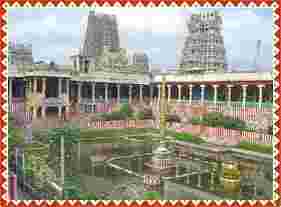 The history of Madurai can be traced back to the 3rd century BC. According to historical evidences, Megasthenes of Greece visited Madurai during that period. The historical records of Madurai prove that the city was under the reign of Pandiya rulers till 920 AD, when the Cholas defeated them. The Cholas ruled for more than 300 years and were overthrown by the Pandiyas in 1223 AD. In 1311, Madurai was attacked by Malik Kafur, general of Alauddin Khilji. Madurai easily fell to the invading army and became a part of the Delhi Empire in 1323 - South India Travel and Tours. 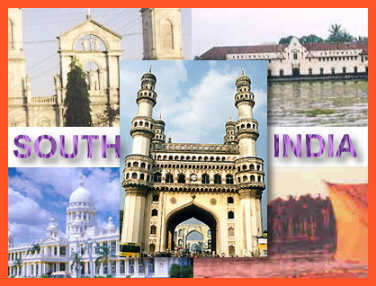 South India Tours - Bangalore , the fifth largest city in India is the capital of Karnataka. The presence of many parks and botanical gardens gave the name of ' Garden city ' to Bangalore. Any tourist can start his tour from Bangalore with its ancient forts, temples, gardens and shopping. 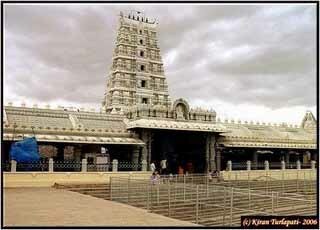 All important tourist attraction in Karnataka can be reached with in a day's journey from Bangalore. The modern city of Bangalore ('Bengaluru') was founded by Kempe Gowda, the Vijayanagar Chieftain of Yelahanga, over 400years ago. But ancient inscriptions pointing to the existence of a village called 'Bengaluru' prior to the 10th century AD. Kempe Gowda built a mud fort in his city with 8 gates which lent their names to different areas inside the fort. Inside the fortress walls, the city grew into a commercial haven divided into localities ('Pet') where individual trades dominated each area - South India Tour Booking..
South India Tour Packages - Pondicherry is a union teritory, which lies within the state of Tamil Nadu.The inherent ambience of Pondicherry, becomes most evident in the oldest part of the town, which flanks the seashore boulevard. The French ruled this territory for 300 years, Pondicherry is a living monument of French Culture in India. The Aurobindo Ashram and 'Auroville' the international township are famous all over the world. Pondicherry traces its origin to Saint Agasthya, the revered sage of the south. The excavations near Pondicherry reveal, that a Roman settlement existed here, 2000 years ago. It was also the site of many a battle between the British and the French, and was the capital of French India, before it attained its independence. Being a small and quiet enclave of Tamil Nadu, it has imbibed the Tamilian culture. Apart from the charming atmosphere, excellent restaurants and cheap beer, what attracts most travellers to Pondicherry is the Sri Aurobindo. 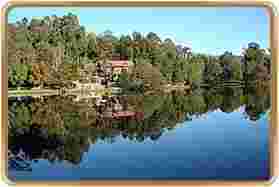 Ooty also known as Udagamandalam is the "Queen of hill stations" and the capital of Nilgiris district. It is one of the most popular tourist resorts in India. Nilgiris means "Blue Mountains". It is a land of picturesque picnic spots. Used to be popular summer and weekend getaway for the Britishers during the colonial days. It is situated at an altitude of 2,240 meters above sea level. One of the reasons people like to visit hill stations is that, they not only offer a respite from the dust and pollution of the city but also give people a chance to see the undefiled beauty of nature. The green hills, the cascading waterfalls and sparkling brooks, all make the hill stations a delight for the eyes of the urban dweller. Ooty is an ideal hill station since it offers all this and much more. Thekkady, about 4 km from Kumili in Idukki district, central Kerala. The pride of Kerala and a testimony to nature's splendour and human innovation, the Periyar Wildlife Sanctuary is situated on the banks of the Periyar lake - an artificial lake, at Thekkady. Here the high ranges of the Western Ghats are clothed in dense evergreen, moist deciduous forests and savannah grasslands. Below this thick green canopy roam herds of elephants, sambars, tigers, gaurs, lion tailed macaques and Nilgiri langurs. In addition to elephant rides, cruises on the lake and treks to the ruined Mangaladevi temple - a beautiful old stone temple situated in the heart of the Thekkady forest, this sanctuary offers the unique opportunity to watch and photograph wild elephants at close quarters. Lake Palace and Aranya Nivas are two idyllic accommodation options set in the sylvan lake side background. Madras, which recently reverted to its historical name Chennai, is the capital of the South Indian State of Tamil Nadu. It is the fourth largest metropolis of India, after New Delhi, Bombay and Calcutta. Chennai is a seaside (and a major port) city where the sea is a rhapsodist blue, hugging the second largest beach in the world. It has many monuments and temples exemplyfying the contributions of the Chola and Pallava Dynasties to the ancient Dravidian civilization. Chennai also has the ancient churches and Cathedrals pointing to British heritage of 150 years. 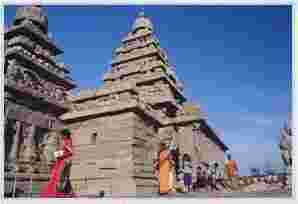 Mahabalipuram, Kanchipuram and Thanjavur are good examples of temple towns where within the temple fortifications grew a multi layered society that preached faith and grew from social harmony. 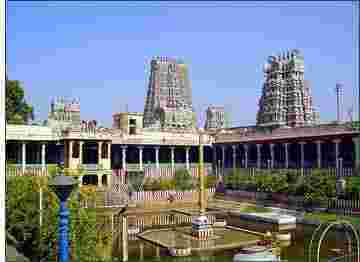 Kanchipuram, also called Kanjeevaram, is famous throughout the country as the center where lustrous silk sarees are woven.